← The ultimate Field Day tent? 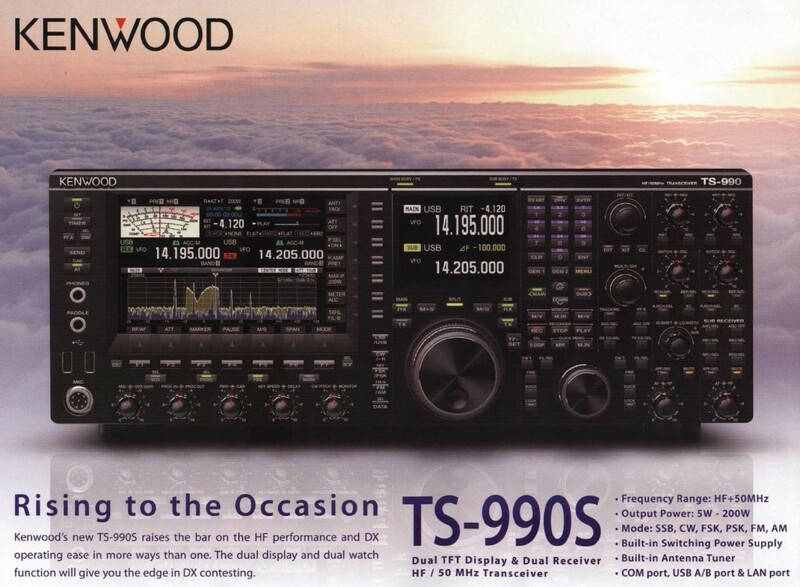 When you open your June 2012 issue of QST, you will find that Kenwood has published a photo and ad (see below) of their new TS-990S in advance of Dayton. This entry was posted in Announcements, News, Product Announcements and tagged Ham Radio, Kenwood, Kenwood TS-990, Kenwood TS-990 Updates, Kenwood TS-990S, Kenwood TS-990S Updates, Kenwood Updates, TS-990, TS-990S, TS-990S Availability. Bookmark the permalink. I would LOVE to see Kenwood come out with a QRP rig. How long has it been since they’ve done that? Ages. Looks like there’s hope for TenTec. Let me run right out and spend 10 grand on a radio. There will be lots of buyer’s remorse when it’s over and done. Yaesu, and Icom learned about over priced rigs and made sure they have lower cost rigs in their line. Kenwood hasent brought anything out that anyone can afford to buy in too long. SO I guess they want an excuse to go the direction of Wisconsin Commerce… Out of Business. I side with all of the above. This looks like a contest rig, not a QRP or entry level rig, and I don’t believe Kenwood has an entry-level in their line (and I KNOW they don’t have a QRP rig in their line). I also know that Bob Heil is under a NDA with Kenwood (we had him present via Skype to our club meeting last month and he mentioned it). Guess that means it will have great audio. I’m not sure where everyone is getting the $10K for this rig from. I’ve seen guestimates in the $5K to $6K realm. Both Yaesu and Icom have rigs over $5K new so what’s the big deal? Heck, Icom has the most expensive one at $12K – what’s that? As for an entry level rig, Kenwood has sub $1K rigs just like the others. I just bought a brand new TS-590 for $1550 – which I don’t think is a bad deal for what you get. Especially compared to the TS-930SAT I bought used a year and a half ago for $600. If this is really what the new Kenwood is going to look like – good for them! They need something to compete with what Yaesu and Icom already have at that price point. Well… we do not need another gazillion dollars priced trx. If it will cost aprox what FT2000 does then it is fine… if they will go “Icom-style” then… get lost… i’ll stick to my “old” TS2k. Good for Kenwood – they needed a high-end rig to complete their line. Now they go from the entry level TS-480 SAT at under $1000, through the TS-590S at about $1600, to this new rig at a higher price – for those willing to pay it. Judging by the number of controls, there will be less menu items to contend with. From an operating stand-point, that may well be a good thing. Will I part with my TS-480 SAT and/or my K3 and make the switch? I seriously doubt it. At heart, I’m a QRPer and like the simple, portable vareity of radios. But I always have a full-featured rig at home and it’s typically the one I operate the most. Out of this rig I seek an exceptional receiver, low noise floor, good overall specs, excellent audio fidelity and–perhaps most importantly–I want a knob and button for every important function. I currently have a Ten-Tec OMNI VI+. It’s been my main rig for nearly a decade now. I absolutely love it. Not only does it have a knob/button for every function, but the controls are even spaced so that my clumsy fingers don’t make mistakes. It looks like it was made for the military and I bet I could even operate it with my work gloves on! I always like to see new innovations coming out of the amateur radio market. There was a point in time when I thought Kenwood was about to pull out. It would have been a shame, because, amongst other things (like Ten-Tec) they’re a company that has always been concerned with audio fidelity. Someone commented earlier that Bob Heil may be working with them through an NDA. The TS-990 is not a radio I will purchase anytime soon. It’s really a contest rig and I bet it’ll be a good one. I simply don’t have the funds to drop on this radio, but at the same time, I can’t wait to see it in person at Dayton. I will post a load of photos here during the Hamvention. I, for one, am glad Kenwood is still in the picture. I mostly agree with W2BLC. The 480 is a nice lower-end rig, the 590 is nothing short of fantastic for its price-point (currently hovering right around $1500), and this completes the range. If this is a $10K rig, however, they over-shot and there won’t be a lot of buyers. If it’s $4000-$5000, I think its going to be a winner for Kenwood….and I do suppose a QRP rig wouldn’t be nice, but with the price of the 480, it doesn’t seem like it would be worth the R&D unless maybe they went with one that has a built-in LiIon battery. Hey, wait a minute….on the picture is 01/Apr/12, just to the right of the meter. IS THIS PIC AN APRIL FOOLS JOKE? Always nice to see new rigs available, but I have to say, this is the ugliest looking rig on the market. I think we have a problem with this picture – look at the dates on the display ! ! ? Well from what i hear its msrp is 5200.00,i hope they have made sure we as buyers dont have to beta test it for them if any issues have not been fixed,as i see it its got to many digi-wigi components in it and will never sound like a well tuned 950sdx,but we will see,im for waiting for awhile before i buy one.But i sure like the s-meter ala icom on it viva 950sdx!!! Whether you are a dx’r, or just a ham with a yen to talk to someone, you don’t need a really fancy rig. All you need is a very good receiver and a transmitter without all the ways to make you sound worse than your real voice. You do not need all the filters or noise reduction to hear stations. If they are so weak or being interfered with, you can strain your ears if thats your fortay. So a cheap or medium priced radio will fill your bill. If you want to spend the money for a super expensive radio, go ahead but be prepared to study and fiddle for days or Months and never be able to use all the bells and whistles you bought, when all you needed was a plain Jane radio, and a good antenna. i can only imagine the price tag is also full of bells and whistles, the average hammer could not afford the radio unless they sell all their ham equipment and maybe first and second born and give several pints of blood to make the deal in getting one of these beauties…. wow what a bunch of jealous sounding crybabies out here! Jeesh- you want a new 817? go buy an 817 and shut your yap! Wow- these comments are the type that make me embarrassed to be a ham. If you don’t like the rig that is one thing, but these comments really sound ignorant- let kenwood do what they want to do and wish them well. either that or work a couple of extra shifts at wallyworld, and get a little scratch together and see if you can swing it. if not then buy that 817! Maybe, this is probably a april Joke, but Kenwood can take this idea for produce a TS 990SDX. I use a TS 950SDX, TS 850SAT. Your comment about the “commenters” amusing.But how long have you been a ham? The vast majority of Hams are inarticulate poorly read and unimaginative. Just tune any band for evidence of such. That they whine over a new radio wanting simpler and fewer knobs is also indicative of the fact that most hams are not “technologists”. Have you ever heard a literate, substantive contemporary technology conversation on the bands? Unlikely. So let these tired old men, fade away. They are irrelevant to the hobby as they wait to die on the bands. May their exit be swift.